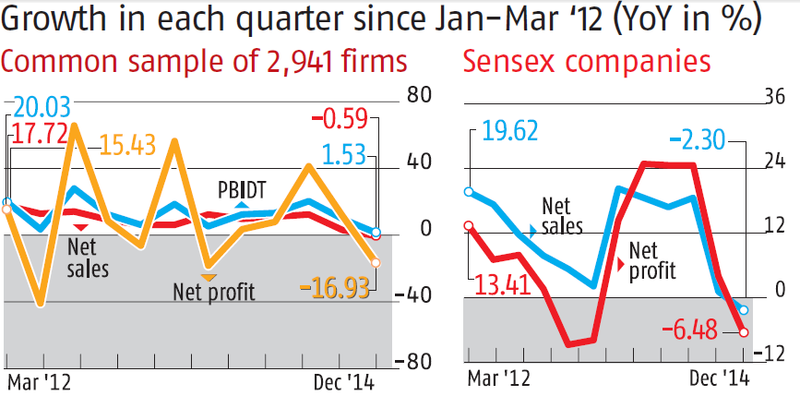 For the three month period ended December 2014, India Inc’s profit growth has been the worst in five quarters, with the aggregate net profit of 2,941 companies declining 16.9%. Even after adjusting for one-offs (or extra-ordinary transactions), it is down 6.3% over the year-ago period... Sales growth is also the weakest in at least 12 quarters. For the Sensex companies, the reported net profit is down 6.5% year-on-year, its weakest show in six quarters, on a 2.2% decline in sales... On aggregate basis, Sensex profit was 7.5% lower than estimates... FMCG companies witnessed a dismal volume growth of 3-7% due to delay in recovery of urban discretionary demand... Operating profit margins of 1,992 manufacturing companies in the sample were down 100 basis points year-on-year and 140 basis points sequentially, largely due to decline in sales and a rise in employee and power and fuel expenses. Barring State Bank of India, most public sector banks reported a sharp rise in bad loans in the quarter ended December, 2014... bad loans of over Rs 24,000 crore were added to already heavy kitty of stressed assets, and public sector banks’ (PSBs) share in it was a staggering Rs 21,466 crore... Banks are likely to see a spike in loan restructuring as the window for getting regulatory leeway in terms of lower provisioning closes on March 31 this year. In the nine months of the current financial year, gross NPAs worth Rs 51,252 crore were added. Thus, outstanding portfolio of bad loans of listed banks was Rs 4, 85,000 crore by the end of December 2014... Rating agency ICRA has indicated that the gross NPAs at system level would breach its earlier estimate of 4.2% by March 2015. It could be around 4.3%. I have told this story earlier. Aggregate demand remains subdued in the face of inflation-induced decline in purchasing power. Rural demand, a major contributor to aggregate demand in the high growth 2003-08 period, was propped up by both the NREGS employment program and the gradual increases to Minimum Support Price (MSP). Without commenting on its merits, their recent scaling back is certain to adversely affect demand. The resultant downward pressure on top-line growth and profitability of corporates, who are already reeling from debt-laden balance sheets, would discourage new investments. The distressed balance sheets of credit suppliers are only a second order problem. Dani Rodrik has a new working paper on premature de-industrialization that highlights the challenge facing countries like India which have staked its growth on manufacturing. He examines the trends in the shares of manufacturing employment (manemp), nominal manufacturing value added (nommva), and real manufacturing value added (realmva) for a sample of 42 developed and developing countries over a long period from late 1940s to early 2010s. 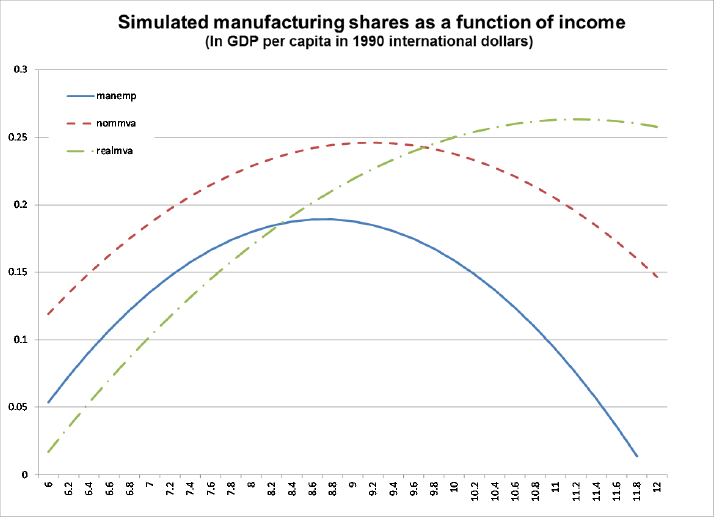 Controlling for various factors, including period and country fixed effects, his regression results point to a much larger effect of premature de-industrialization on manemp than on realmva. For a representative country with median population in the sample (27 million), the manemp peaks at much lower income levels than realmva. The manemp starts to fall after peaking at about 20% at an income level of $5500, while realmva peaks much higher and at a much later stage (in fact at $70000 per capita income). 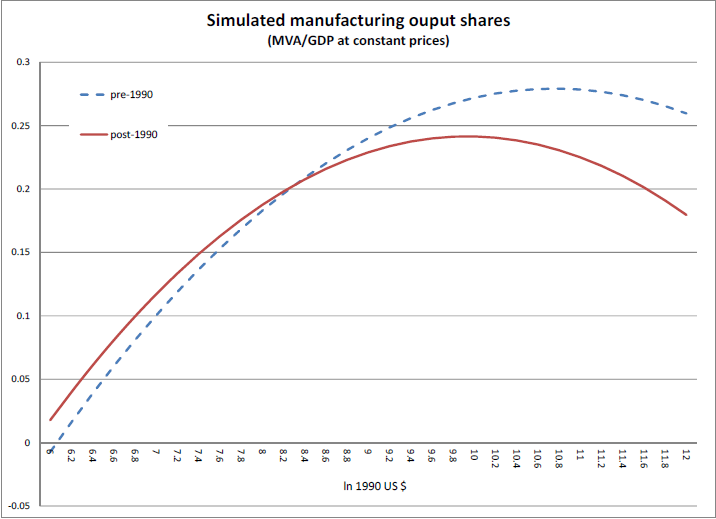 Since the relative price of manufacturing declines as countries get richer, the nommva peaks earlier than realmva. 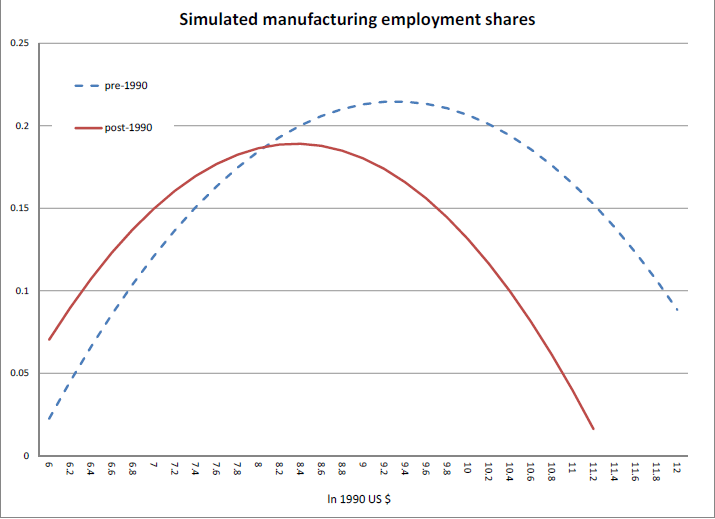 His model also points to a strengthening of the premature de-industrialization trend among economies since the 1990s. For the representative economy, since 1990 the share of manufacturing employment tends to peak at earlier income levels and at a lower rate. The same trend is observed for manufacturing output in recent decades. Interestingly, Prof Rodrik finds that these trends are less strong for countries, especially from East Asia, who have had a comparative advantage in manufacturing. These trends can be possibly explained by a combination of two arguments. The demand-side argument is that consumption preferences shift away from goods and towards services as incomes grow. This would cause a shift away from manufacturing in both employment and value added. The supply-side argument is that in view of technological progress and its impact on manufacturing productivity, the elasticity of substitution of labor between manufacturing and other sectors is less than one. However, while this causes the employment share to decline, the share of value added keeps rising. I have not written a post in a while, distracted by work load which has reduced my investment update activities. As you know, I always start with my view of how I believe the economy is performing. Using my best this market is definitely not "Starting from the Bottom". Do I have some grand plan...Yes and NO. The stock market is often a leading indicator and has been doing VERY well for a year. This market started at the bottom (hit bottom) in 2009 AND 2013 and now we are here at market highs. This means things have rebounded very well and astonishingly there hasn't been much of a pause. What this means to portfolio: I have kept it simple...Starting this quarter whenever bse Sensex enters into the 30000 territory I take the time to SELL some of my big winners at the top. At this point, I don't mind holding a bit of cash, buy something paying a dividend, and or wait until stocks I like drops. Activate the Activist Investors: When I sell some winners, I'm buying stocks that may rise quickly because they are being bought by other companies or are being pushed to do something by big time investors. An investment decision should be based on investment horizon, goals and portfolio makeup and not purely on market movements. Though you must tweak your portfolio to take advantage of the possible bull run in the coming years, you should not go overboard. "You should consider time horizon. If you are a long term investor, you must remain invested irrespective of the market conditions. You have to decide whether you want to play a Test, an ODI or a T20 match,"
If you have been investing for the last few years when equity markets were not doing well, you may already be sitting on good gains without doing much. That's the power of equity. Years of below par performance can be made good in just a few months. Should you book profit if you have made decent gains? "You can book profit partially if you need the money or for adjusting your asset allocation. But do not stop SIPs as we feel the equity market cycle is yet to pick up". You must watch valuations of stocks they are holding. Besides, it is important to keep track of policies that may impact sectors the stocks belong to. If you are a new to Equity, it is certainly the time to have some exposure to equities, but do not go overboard. Invest in a staggered manner as equities will witness a lot of volatility in the next 12-18 months. Any fall will be an opportunity to enter the market. If you are investing directly, look at earnings of companies whose stocks you are holding. The financial results of companies will decide if they deserve the valuations at which they are trading. Even in a bull run, ultimately it is earnings that drive stocks. We have already seen few disappointing results with its last quarter results. Others have also posted mixed results. 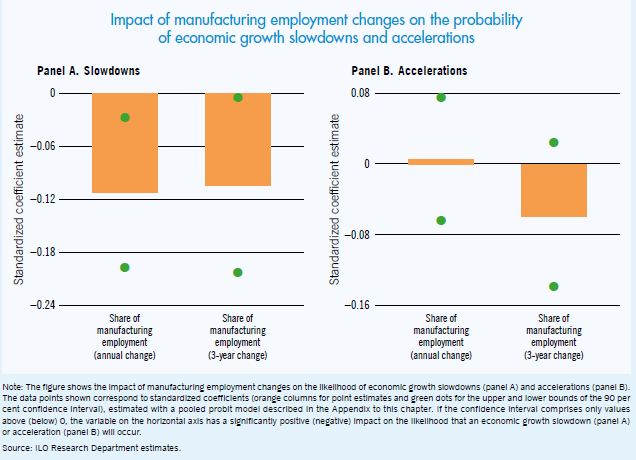 Do these indicate a shift in outlook for the sector? However, analysts see an improvement in earnings going forward. "Corporate profitability is expected to grow faster than nominal GDP with companies becoming more efficient in the last down cycle, operating leverage playing out and some pricing power coming back. The deleveraging of corporate balance sheets has also begun, supported by an improvement in market sentiment and cash flow,"
Typically, mid- and small-cap stocks or funds should not account for more than 20-30% of the portfolio. When equity markets are doing well, investors lap up these stocks in search of high returns. These move faster and in bull markets give much higher returns than the large caps. However, investors forget that sharp price changes both ways, and when markets tank, these crash much more than the large-caps. Bull markets, ironically, can be a distraction. You should be consistent and have realistic expectations to maintain discipline so that you can take the maximum advantage of the bull run, if at all there is one in the near future. Diversify portfolio with a judicious mix of equity, cash and debt. Stick to the ideal asset allocation. Review your portfolio once a quarter and adjust it to achieve the desired level of debt and equities. The horizon of an equity investment should be at least three years. For short-term needs, keep money in liquid funds. For two-three years, invest in medium-term debt funds. A lot of discipline goes into creating a big long-term corpus. New equity investors should invest through mutual funds and not directly. "It may be a prudent strategy to add the flavor of funds in the balanced or dynamic category in a portfolio which seeks to capture the upside by increasing allocation to equities when markets are declining and protect the downside by reducing exposure when markets are rising,"
'The unprecedented returns over the last few months have built up huge expectations in the minds of investors. We believe investors should moderate return expectations'. A strong, growth oriented and business friendly government bodes well for economic growth and for businesses. Current P/E multiples of equity markets are reasonable – neither expensive, nor cheap. However, corporate earnings should be better than estimates as corporate margins are significantly below the long term averages and should improve as capacity utilization and business conditions improve. There is thus room for multiples to expand as growth improves and as interest rates move lower besides strong earnings growth. In our opinion therefore, the outlook for equities is promising and there is merit in increasing allocation to equities (for those with a medium to long term view) in a phased manner and to stay invested. This emailer is addressed to and intended for the investors of Ritesh Sheth & Tejas Consultancy only and is not spam. You are advised to contact Ritesh Sheth & Tejas Consultancy to clarify any issue that you may have with regards to any information contained in this emailer.The views are personal. Ritesh Sheth & Family or Tejas Consultancy does not guarantee the accuracy, adequacy or completeness of any information in this emailer and is not responsible for any errors or omissions or for results obtained from the use of such information. Ritesh Sheth & Family or Tejas Consultancy does not have any liability to any person on account of the use of information provided herein and the said information is provided on a best effort basis. In case of investments in any of our schemes, please read the offer documents carefully before investing. The information contained herein is confidential and is intended solely for the addressee(s). If you have erroneously received this message, please immediately delete it and notify the sender. We virus scan and monitor all e-mails but are not responsible for any damage caused by a virus / alteration of our e-mail by a third party after sending. The contents of this message do not necessarily represent the views or policies of Tejas Consultancy. Can India emulate China's quarter century long episode of near double-digit growth rates? There are compelling reasons to the contrary, none more important than the following two graphics. The first graphic shows the steep differential between the two countries' gross domestic savings and gross fixed capital formation respectively. China's spectacular growth story has been underwritten by the country's high savings rate, which rocketed beyond 50% of GDP in last decade. Its gross domestic savings rate today is almost twice as large as India's and its gross fixed capital formation is nearly twenty percentage points higher. 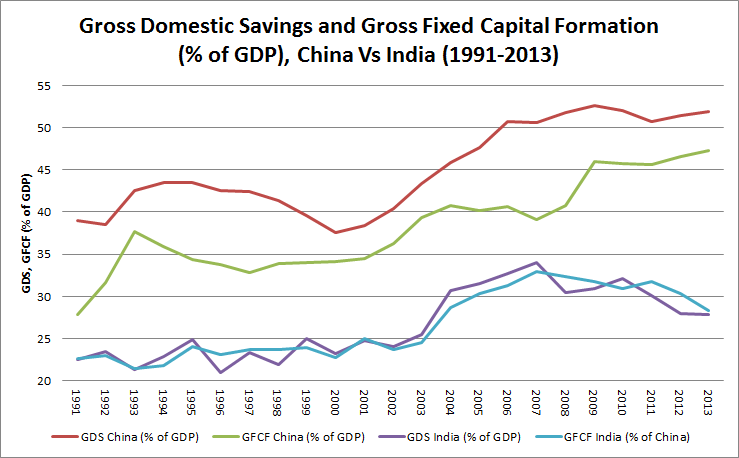 Further, even as India's savings rate has been declining, that of China shows no signs of abating. Given the vastly different contexts, it appears unlikely for India to come anywhere close to the savings and investment rates achieved by China. 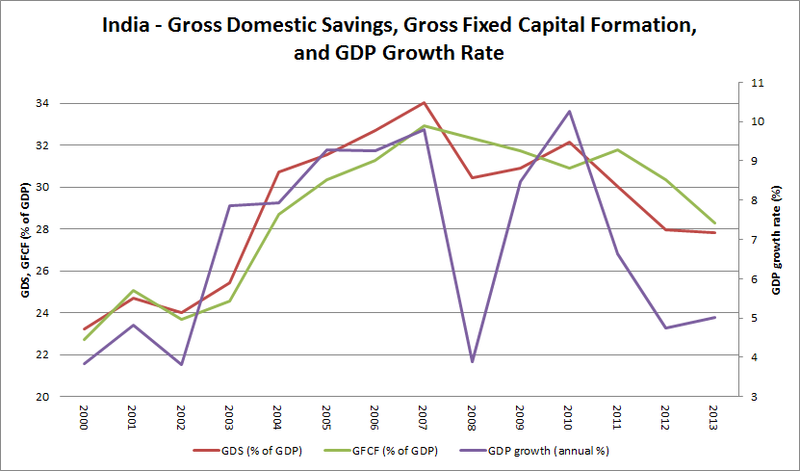 The second graphic shows how in case of India the fall in gross domestic savings and resultant decline in gross fixed capital formation coincided with the transition to the current lower growth trajectory. This clearly illustrates why a recovery to a higher GDP growth trajectory requires an increase in the country's savings rate from its 2013 low of 28% to its 2007 peak of 34% of GDP so as to support an investment rate in the mid-thirties. The sharp rise in savings in the 2003-08 period came on the back of a sharp rise in private corporate savings, which nearly doubled during the period. But given the debt-laden corporate balance sheets, a recovery of corporate savings to its peak rate of 8-9% of GDP appears unlikely in the foreseeable future. Even the current savings rate figure is deceptive since the share of household savings being locked up in illiquid and unproductive investments like real estate and gold has grown in recent years. This shrinks the pool of investible savings available. So here is the challenge. High growth rates cannot be sustained without high investment rates. But high investment rates in turn requires high domestic savings rate. The alternative of sourcing foreign capital runs the risk of assuming large current account deficits which leaves the country vulnerable to sudden-stops and capital flight. There are no easy answers. I had blogged earlier about the headwinds from technology induced labor market disruptions and structural changes in manufacturing sector that Indian economy will have to navigate. In this context, Tim Taylor points to the January 2015 issue of ILO's World Employment and Social Outlook which has a few interesting stats. The report describes many people as holding jobs in the "vulnerable employment" sector - or "own-account work and contributing family employment". 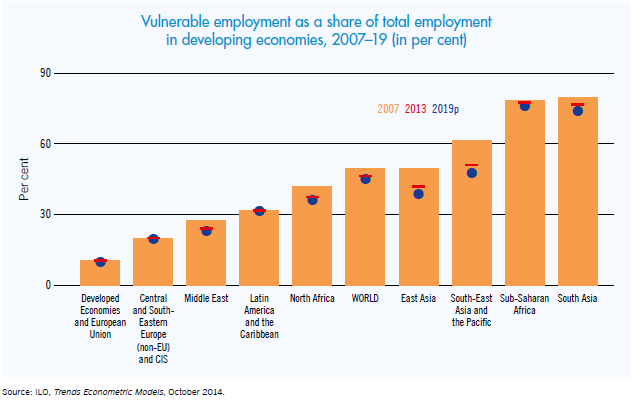 It finds that in 2014, 75.6% of the workforce of South Asia worked in "vulnerable employment", marginally smaller than the 76.6% in Sub-Saharan Africa, and far higher than elsewhere. 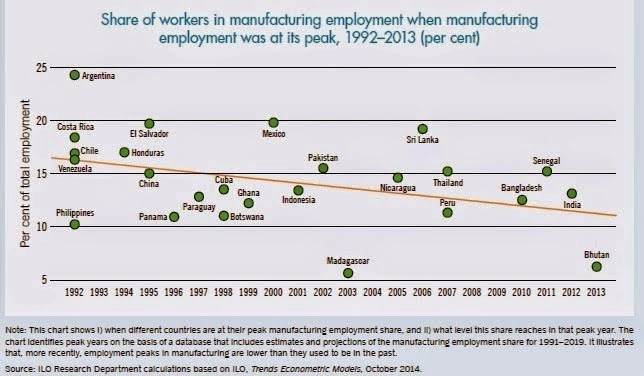 It also dwells on the issue of premature de-industrialization, as reflected in this graphic which shows that manufacturing's share of employment has been peaking much earlier among the latest entrants into the global manufacturing supply chain. This assumes great significance for India, which has recently staked its growth behind manufacturing. 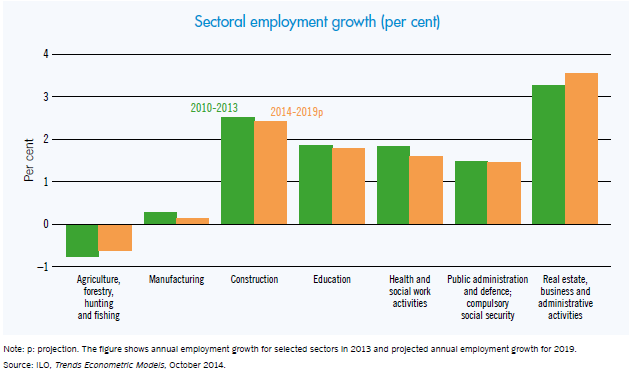 In fact, apart from agriculture, manufacturing is expected to have the slowest employment growth rate among all sectors in the 2014-19 period. In fact, evidence from 2000-13 from across countries shows that manufacturing's share of employment has either declined or been stagnant even during periods of growth acceleration. 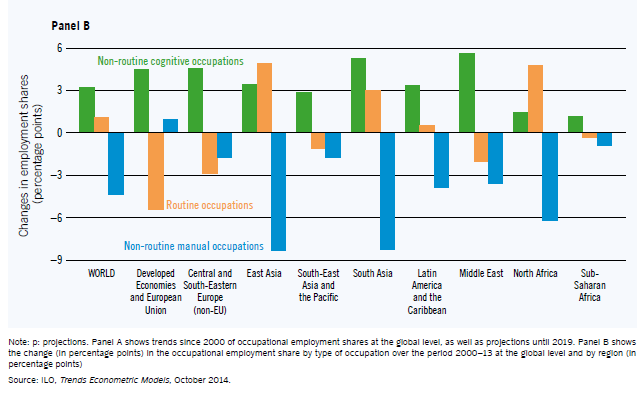 In the 2000-13 period, the share of non-routine manual occupations has declined sharply in East and South Asia, whereas that of non-routine cognitive occupations has risen more than that of routine occupations in South Asia. However, going ahead, a continuation of this trend will depend on the quality of workers joining the labor force. It is here that India's pathetic learning levels are a cause for great concern. Impressive compilation of project finance deals from 2014 in the World Finance magazine. A summary of few interesting ones. 1. Off-load construction risks and refinance the commissioned project. The 95 km Saltillo-Monterry highway was constructed by CAMS, a wholly owned subsidiary of Isolux Infrastructure Netherlands BV, the power and transportation construction and management arm of infrastructure major Grupo Isolux Corsan, through bank-syndicated loans. The construction was badly delayed, leading to renegotiations, including extending the concession period to 45 years. The road was opened to traffic in phases between 2009-11. In 2013, after protracted re-balancing of the bank loans, CAMS launched two bond-issuances to refinance the project through project bonds - a senior bond maturing in 2037 and carrying an inflation-linked fixed interest rate of 5.9% and a much larger sub-ordinate issue maturing in 2039 and an inflation-linked fixed interest rate of 8%. The project though remained on the balance sheet of Isolux and its O&M is being managed by Isolux's in-house team. 2. Construction and asset management are qualitatively different types of activities, requiring both different sets of concessionaires and financiers. Metro da Sevilla is the 18.1 km metro-line that is the only mass rail transit system servicing Spain's fourth largest city. The line which connects 21 stations was awarded as a private design, build, finance, operate, transfer concession in 2003 to a consortium of construction contractors and its construction was completed in 2009. Once construction was completed, the tenure of Spain's first privately developed and operated metro rail concession was re-negotiated in 2009 and extended till December 2040. In 2014, the Metro da Sevilla was taken over by a consortium led by Globalvia, one of the world's leading infrastructure management companies, in a 634 million euros deal which was financed by equity and three senior debt tranches with European Investment Bank (EIB). The concession has revenue streams that combine availability-based payments and traffic-linked income. 3. Long-term loans by the national infrastructure lending institution (say, IIFCL) with the condition that the borrower must float bonds once the project is commissioned. This would, apart from optimizing the cost of capital would also enable the FI to free up its loan book and move on with further lending. The Sao Paulo Gaurulhos International Airport was being operated by Infraero, the 100% government owned agency, which off-loaded 51% stake in February 2012 for BRL 16.2 bn to a consortium Invepar-ASCA for maintenance and expansion of the airport for a period of 20 years. BNDES gave a loan for the first phase of the project with this condition. BNDES encourages its lenders by offering them more favorable conditions (eg amortization schedule) than if the bonds were not issued. 4. Leverage sovereign wealth funds to invest in infrastructure. Wessal Capital, a joint venture of five SWFs - Morocco, Kuwait, UAE, Qatar, and Saudi Arabia - established at the Moroccon government's initiative, has amassed $3.3 bn in equity capital to invest in transformational projects to create destinations and promote tourism in Morocco. Its first project, Wessal Casablanca Project, involves the regeneration of a 12 hectare harbor area and the historic old-town Medina of Casablanca through a $700 m PPP, to be completed in 5 years. It will feature world-class tourism infrastructure and a marina with comprehensive cruise ship terminal. Wessal's Capital's next project is the redevelopment of Rabat City. 5. Deployment of PPPs in social sector projects. Greece's Attika Schools PPP project, which draws heavily from UK's Building Schools for the Future PPP program, involves the design, build, finance, operate, and maintenance concession for 24 schools for a period of 27 years at a cost of 110 million euros. The 24 schools were split in two packages of 10 and 14 schools respectively so as to mitigate concentration risks and promote competition. Though the concessions were awarded in 2010-11 to ATESE and J&P Avax, it was renegotiated in the aftermath of the crisis and achieved financial closure in Q2 2014. The project draws funding from the EU's innovative city infrastructure funding tool, JESSICA, which is an initiative of European Commission, EIB, and Council of Europe Development Bank (CEDB). JESSICA aims to correct market failure by investing in sub-commercial terms to support viable urban projects that would not have otherwise attracted sufficient private investment. 6. PPP in urban transportation infrastructure. In 2013, in a $720 million deal, Rutas De Limawas granted a 30 year toll concession for construction, betterment, expansion, conservation, and O&M of 115 km of the three main highways incoming to Lima. Apart from ensuring more effective transportation connectivity to Lima, its specific objective was to improve traffic and road conditions, service standards, and road safety. The project will be financed by a combination of bank loan tranche (for capex financing and whose repayment will begin more than 1.5 years after project financial closure); a local currency denominated fixed rate bond tranche to finance immediate capex and investments at financial closure' and an inflation-linked local currency denominated tranche to be disbursed based on capex and investments chronogram. Barring State Bank of India, most public sector banks reported a sharp rise in bad loans in the quarter ended December, 2014... bad loans of over Rs 24,000 crore were added to already heavy kitty of stressed assets, and public sector banks’ (PSBs) share in it was a staggering Rs 21,466 crore... Banks are likely to see a spike in loan restructuring as the window for getting regulatory leeway in terms of lower provisioning closes on March 31 this year. In the nine months of the current financial year, gross NPAs worth Rs 51,252 crore were added. Thus, outstanding portfolio of bad loans of listed banks was Rs 4,85,000 crore by the end of December 2014...Rating agency ICRA has indicated that the gross NPAs at system level would breach its earlier estimate of 4.2% by March 2015. It could be around 4.3%. Governments across the world see public private partnerships (PPPs) as a means to tide over their fiscal constraints and substitute for public spending. The government in New Delhi is no different. This view of PPPs is misplaced and is most likely to result in their failure. I have written about it here arguing that PPPs are effective when there are real efficiency gains to be had from involving private partners. In normal times, creditors provide the most rigorous due diligence on projects. Since creditors are foremost concerned about repayment, their incentives are aligned towards ensuring that credit is channeled into financing only commercially viable projects. Such projects have a credibly guaranteed revenue stream to repay the project debt. But this disciplining power of credit breaks down during the good times, especially during a credit boom. In an environment of cheap and plentiful credit, creditors go in pursuit of yield, assuming ever greater risks. This weakens the screening mechanism that distinguishes the commercially viable projects from the rest. Project developers are encouraged to peddle grandiose projects with large risks and doubtful commercial viability. Credit gets mis-allocated into projects of doubtful utility and commercial viability. This is a classic case of adverse selection. PPP projects which otherwise would not have achieved financial closure, leave aside commercial break-even, find lenders when the disciplining powers of credit breaks-down as a credit bubble inflates. They get re-negotiated when the bubble bursts. This should not be seen as a symptom of deficient PPP plumbing or regulatory failures. These projects were never suitable for PPPs, should either never have been taken up or have been financed by public spending. Accordingly, the re-negotiations in India's national highway toll road and ultra-mega power projects due to unrealistic traffic estimations and low-balled tariffs are less a problem of policy failure and more the manifestation of adverse selection.